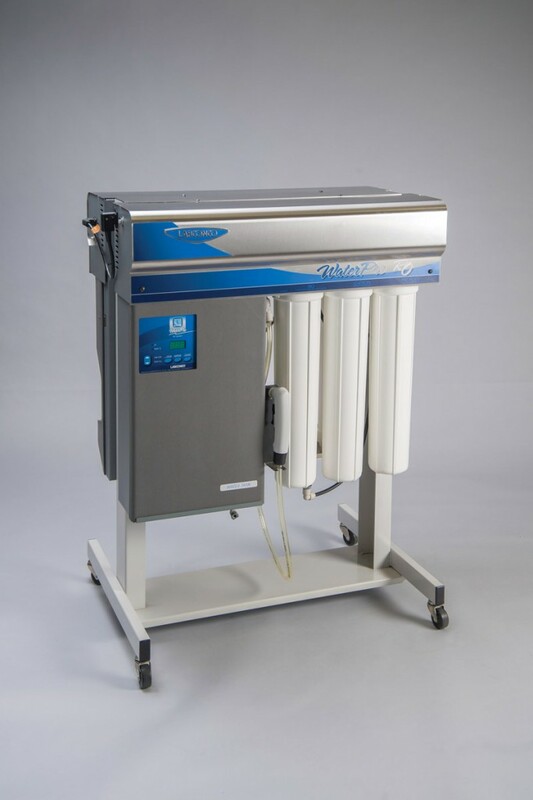 WaterPro RO/PS Mobile Stand adds portability to the WaterPro RO Station and WaterPro PS Polishing Station. Constructed of epoxy-coated steel with 2" diameter hard rubber casters. Includes hardware to mount the WaterPro RO and WaterPro PS back-to-back on the stand. A single WaterPro RO may be mounted on one side or two WaterPro RO Stations may be mounted back-to-back. Dimensions (with WaterPro RO Station and WaterPro PS Station attached): 31.2" w x 23.5" d x 43.5" h (79.1 x 59.1 x 110.5 cm). Stands support WaterPro Purification Systems on horizontal surfaces when wall mounting is not desired.